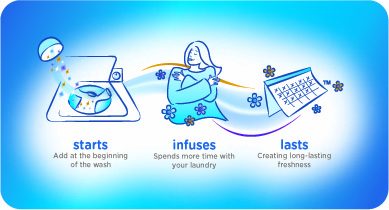 Disclosure: “I am a Purex Insider and help spread the word about the Purex® family of laundry products. As an Insider, I receive sample product and incentives in exchange for participating in brand related activities. I like Purex’s products because they are affordable and they leave my clothes looking clean and smelling fresh. I was given the opportunity to write a review for one of Purex’s newest products: Purex Complete Crystals Softener (crystals). Below you will find what I like most, and what I think could be different. The Crystals leave my clothes smelling fresh and clean. The Crystals are safe, even in HE washers. My clothes were soft to the touch as I pulled them from the washer. It is winter now and taking them out of the dryer reminded me of a warm summer’s day. It is safe on children’s sleepwear, active and athletic wear, and doesn’t allow dirt and debris to stick to fabric. The Crystals are easy to use and they work. You just pour a small amount as directed onto your clothes at the beginning of the wash cycle and turn it on as you normally would. Below is a snapshot of how it works. 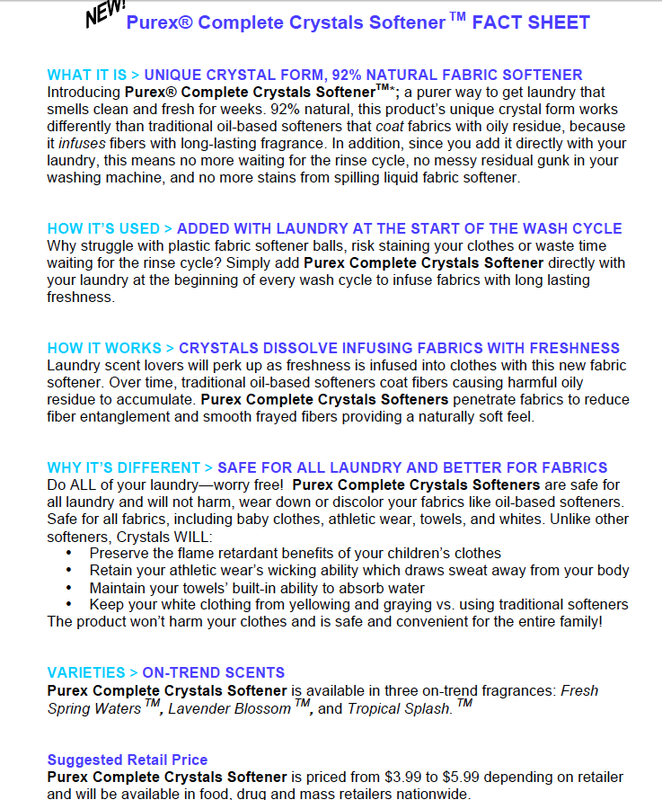 By adding the Crystals to the beginning of the wash cycle it helps save time during your laundry process. The Crystals are Eco-friendly, so if you like being “green” this is a likable product. I did not notice any static problems, but I rarely do. The bottle is eye-catchy so it encourages you to want to use it. Even though it is 92% natural, I would keep this and most products I use within my home out of my child’s reach. I think there should be an unscented option. I try not to use many fragrances on my kid’s clothes so an alternative would be nice. Overall, would I recommend Purex Complete Crystals Softener? Of course, it does the job that it was created to do. Please let me know if you find this review helpful or share your personal experience with Purex Complete Crystals below. Purex Complete Crystals Softener are now available at your local Walmart stores. If you are interested in more information about Purex Complete Crystals Softener click on the link. Here is a snapshot of how it works. Laundry Detergent: Which One Do You Vouch For?